In 2001, I signed up to bring fruit to the Agape Feast following my church’s Easter Vigil. After some experimentation, I invented a confection I called Agape Kiwi. The recipe below—perhaps not yet test-kitchen perfect—is the result of several years of development of what has become a popular dessert. The latest changes to the recipe are the product of the 2008 Agape Feast at my church. The objective of the recipe is to create little fruit sandwiches encased in chocolate. This would be easier to achieve if all the fruit were cylindrical, but only the banana is at all coöperative in this regard. The variability in size and shape of the fruit makes the quantities shown above only approximate. Cut the strawberries into thin slices and place them in a single layer on a tray. The small ends are not used. Sprinkle the slices lightly with sugar. Remove the skin from the kiwis. With a sharp paring knife, cut off the ends of each kiwi. Stand the fruit on one end and cut off strips of skin from top to bottom. Keep the strips thin to avoid squaring off the fruit. Once the skin is removed, cut the kiwis crosswise into thin slices. The slices should hold together and can be between ab out 1/8-and 1/4-inch thick. Peel the banana and cut slices crosswise no more than 1/4-inch thick. Place a tiny dollop of cream cheese on each strawberry slice. The cream cheese functions less as flavoring than as adhesive, so do not be over generous. Press a kiwi slice over each strawberry. Repeat this procedure, adding cream cheese and banana to the stacks of fruit. 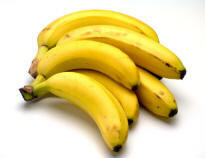 Trim the stacks around the banana slices, so that they are approximately cylindrical. Next, melt the chocolate. This is not as straightforward as it might seem. For best results, the chocolate should be tempered. I recommend melting 2/3 of the chocolate in a double boiler over warm, but certainly not boiling, water. Stir the chocolate constantly, not letting it get warmer than about 113°F. Remove the top pan, put in the remaining chocolate, and slowly reduce the temperature to about 87°F. Stir in the shortening and mix thoroughly. (An instant-reading electronic thermometer is helpful. My candy thermometer has marks for melting and dipping chocolate, and, if yours is so marked, this may be even more helpful.) Maintain the chocolate at this temperature, heating it over warm water as needed. If you are not used to working with chocolate, the material will seem surprisingly cool to work with. Be sure not to let any water come into contact with the chocolate. (The top of the double boiler should be absolutely dry before adding the chocolate chips, for example.) The vegetable shorting is intended to make the chocolate flow better. It does seem to help and does not seem to have undesirable side effects. It is not essential, however. Follow the procedure below to coat the fruit. Do not even consider trying to dip the fruit in the chocolate, as chocolate will not adhere to anything wet. (This is true of your fingers as well, and you are likely to find yourself spending a lot of time fishing for your fruit in the liquid chocolate.) Instead, we encapsulate the fruit. Cover two cookie sheets with waxed paper, baking parchment, or aluminum foil. To coat one of the sandwiches, drop a small amount of melted chocolate on the cookie sheet. Place one of the stacks of fruit on top of it, banana side down, pushing gently to distribute the chocolate under the fruit. (Don't let this chocolate base become too thin, however.) Then spoon a small amount of chocolate on the fruit and use a utensil—I use the back of a teaspoon—to ice the fruit as one would a cake. Be sure that the chocolate completely covers the top and sides of the fruit stack and connects to the chocolate base. When all the fruit has been iced, place the cookie sheets in the refrigerator. Once the chocolate has hardened, carefully peel individual pieces of candy from the paper or foil. Keep the chocolates in the refrigerator until shortly before you are ready to serve them. VARIATION: After icing the fruit with chocolate, sprinkle grated coconut on top.